Place tempeh in a large shallow container. In a small bowl, whisk together soy sauce, vinegar, maple syrup, liquid smoke, paprika and cumin. Pour mixture over tempeh. Cover container and chill tempeh for at least 8 hours, flipping once. Place onion slices, 1 tablespoon lemon juice, sugar, and salt in a bowl. With your hands, massage onions until tender and pink, about 2 minutes. Chill until ready to use. 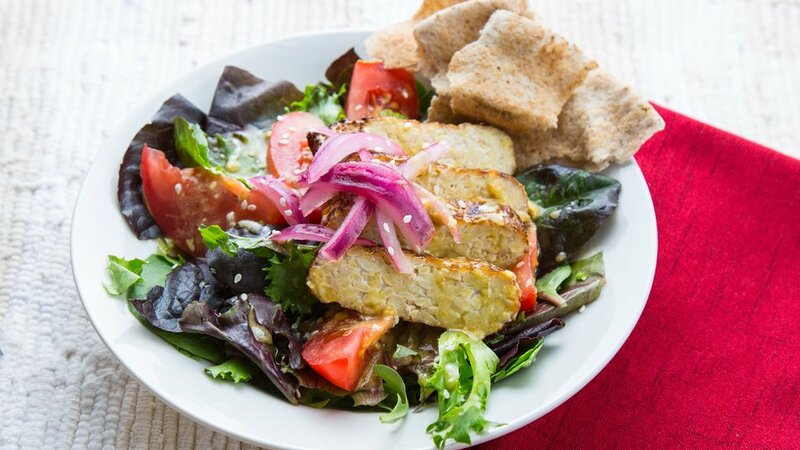 Remove tempeh from marinade. Place block of tempeh on grill grate and cook for about 5 minutes, pressing with a spatula once or twice to make grill marks. Brush on some reserved marinade, flip the tempeh and cook the other side for another 5 minutes, pressing again with a spatula. Remove tempeh from heat and, once cool enough to handle, slice into 1/2-inch lengths. Place pitas on grill and heat until toasted and crispy, about 30 seconds per side. Break pitas into 2-inch pieces. Whisk together olive oil, 1 tablespoon lemon juice, mustard, and a couple pinches of salt. Divide salad greens, tomato, and onion among serving plates and drizzle on dressing. Divide pita pieces and tempeh slices on plates. Sprinkle salads with sesame seeds. Serve.